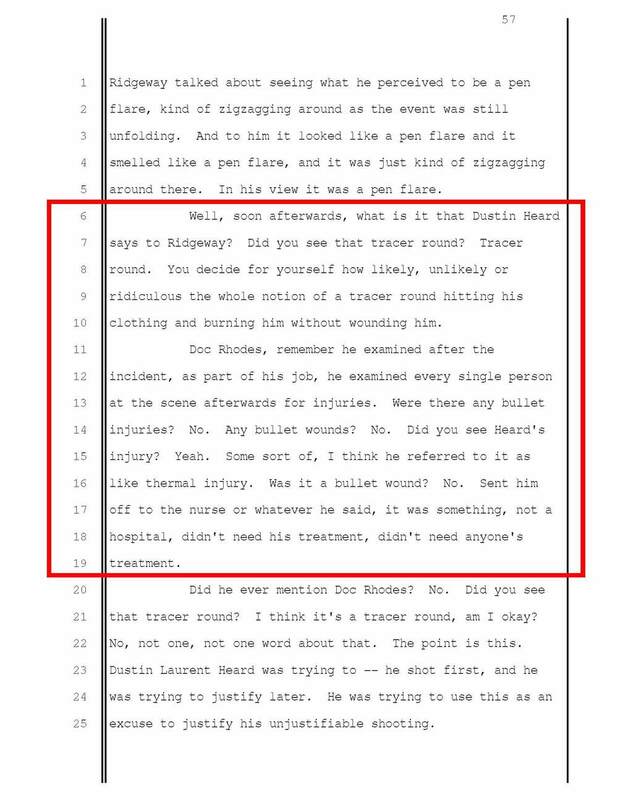 This page highlights evidence related to Dustin Heard's burn injury from September 16, 2007, consistent with a tracer round. This page highlights evidence related to the burn injury suffered by Dustin Heard, rear turret gunner on September 16, 2007. What follows are testimony and exhibits that support Dustin Heard's claim that he was hit by a tracer round during the gun fight on September 16, 2007 in Nisur Square. 1) In 2007, the Fifth Man (front turret gunner) told investigators that Dustin Heard claimed to have been hit by a tracer round. 2) Somewhere over the course of time, the Fifth Man found it necessary to "correct" Dustin's own experience by converting the tracer round into something other than incoming fire - a pen flare. 3) The Government, responsible for having evidence tested by the FBI - knowing full well that the results of the testing were going to be TRIAL evidence sponsored by an Expert Witness, tried to get away with testing ONLY for the pen flare described by the Fifth Man, but NOT a tracer round, even though they KNEW that Dustin Heard had stated he thought it had been a tracer round. 4) Prior to his testimony at trial, the defense team asked to speak with the government's Expert Witness. The meeting was conducted over the phone. The government attended that phone conference. During that call, the defense learned that the Expert Witness had never been asked to test a tracer round. After the call concluded, the prosecution sent an email to the Expert, asking him to test a tracer round. 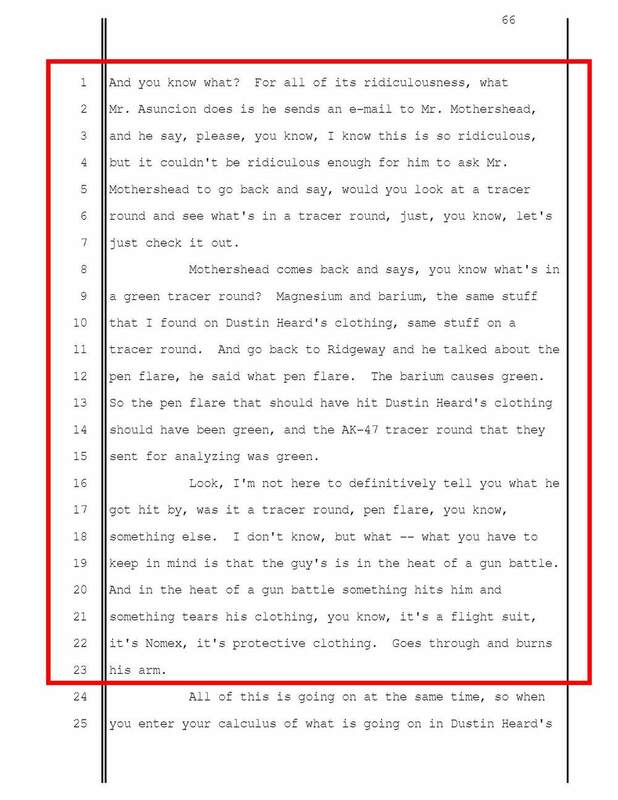 5) At trial, the Expert Witness agreed - he could NOT determine the source of the burns to Dustin Heard's clothing came from a pen flare, but that it was just as likely a tracer round, just as described by Dustin - a battle-savvy veteran who had been in his share of firefights. 6) The Expert Witness testified the DAY BEFORE the Fifth Man took the stand. 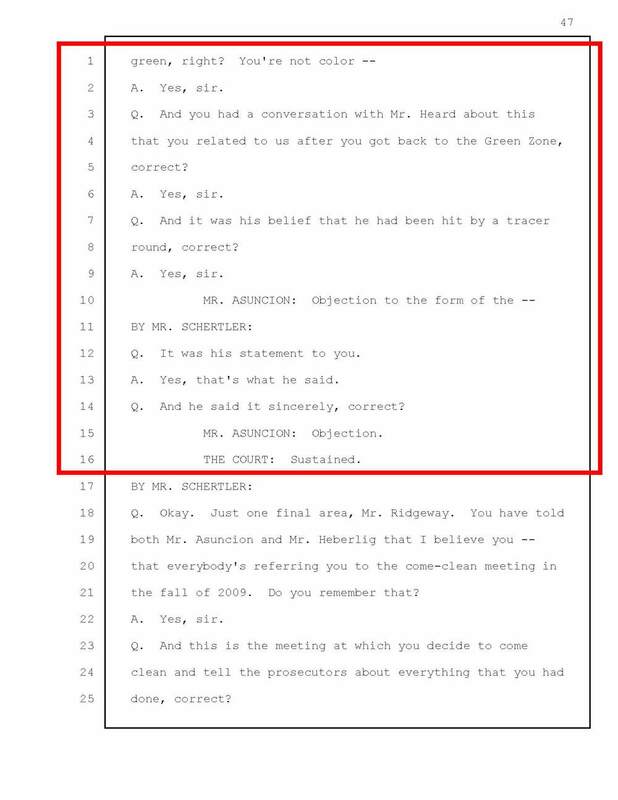 Notice all of the color in the Expert Witness testimony refers to "green." 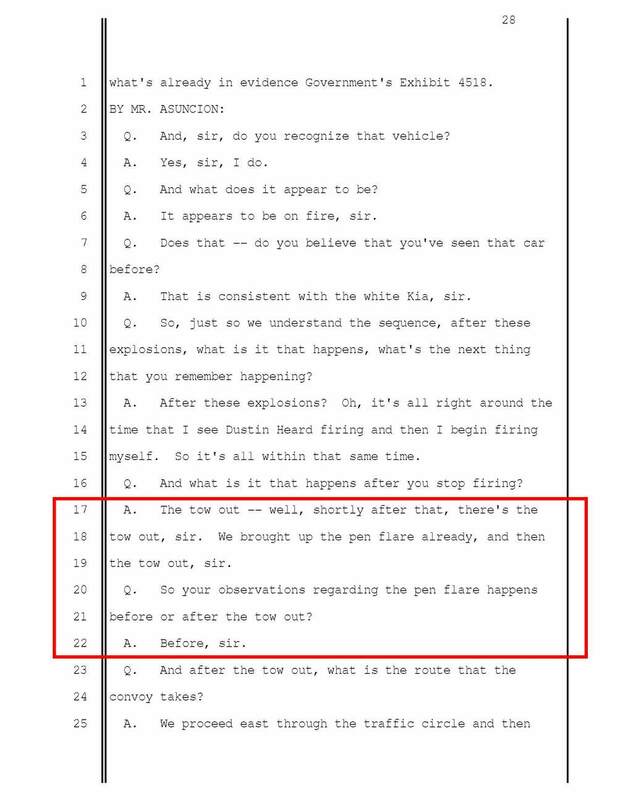 7) The Fifth Man's testimony describes his certainty that Dustin Heard was hit by a pen flare because said a pen flare hit near his turret and bounced around it, somewhere between him and Dustin Heard. As the two turret gunners aren't likely to be facing one another during a firefight, how could a flare that Dustin wore on the front of his shirt manage to fly behind him and "bounce around" between him and his front gunner? 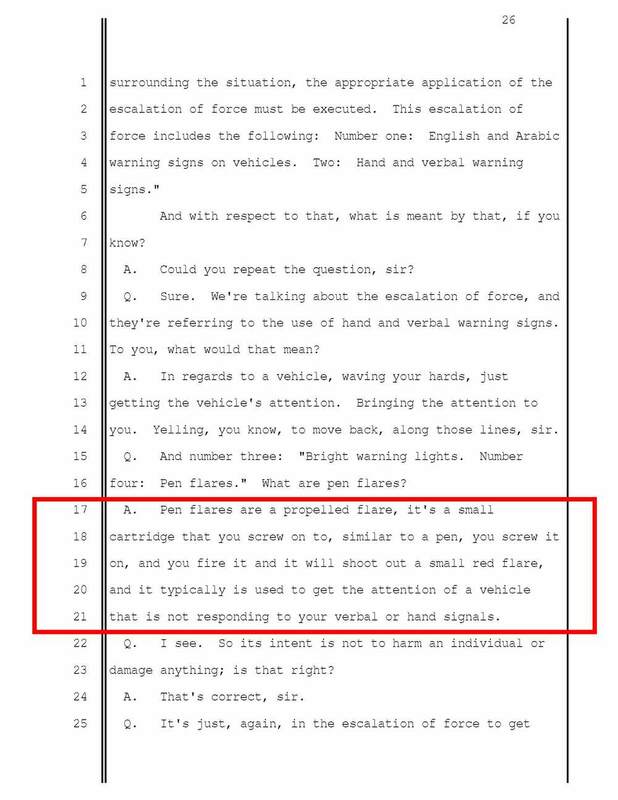 8) During the prosecutor's direct exam, the Fifth Man's testimony regarding the color he saw is clearly red. 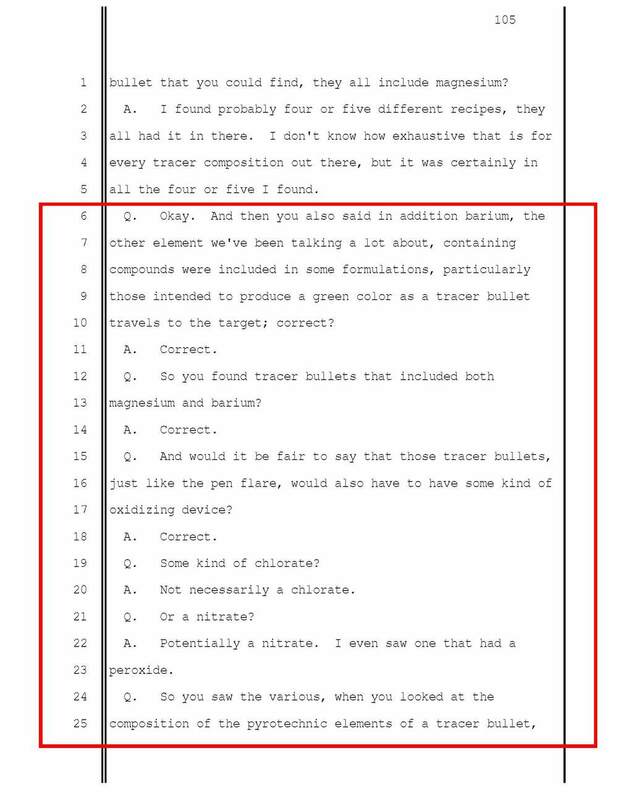 During the cross-exam, however, he suddenly shifts the color to "green-red"...the day AFTER the prosecution's Expert Witness testified only as to the color "green." 9) The Fifth Man, himself, puts the timing of this incident as PRIOR to the tow-out...when the majority of the incoming was happening. 10) The prosecutor tried to belittle Dustin Heard - a decorated veteran - by claiming it was ridiculous to think that a tracer round burned Dustin's NOMEX protective gear without seriously burning Dustin. NOMEX gear is DESIGNED for EXACTLY that. The prosecutor was allowed to condescend during trial, and continued in their Closing argument. Despite Dustin's counsel clearly exposing the government's "expert" testimony for the shenanigans it was, the jury bought it. You decide - can the prosecution's evidence and testimony from an Expert Witness be trusted when they clearly attempt to skew the results? Can the Fifth Man's testimony be trusted when he creates versions and details on the fly - how do you pull out the parts that are true from the parts that he believes will get him a better deal? * There is a photo of AK shells, taken immediately after the incident, from a location where the convoy stated it was taking fire. That photo disappeared for 7 years. * There is damage to the convoy, not just the Command Vehicle, but to the others as well. The government tried to claim the convoy damaged themselves. * The rear turret gunner suffers a burn from a tracer round, but is protected by the quality of the gear he wears. 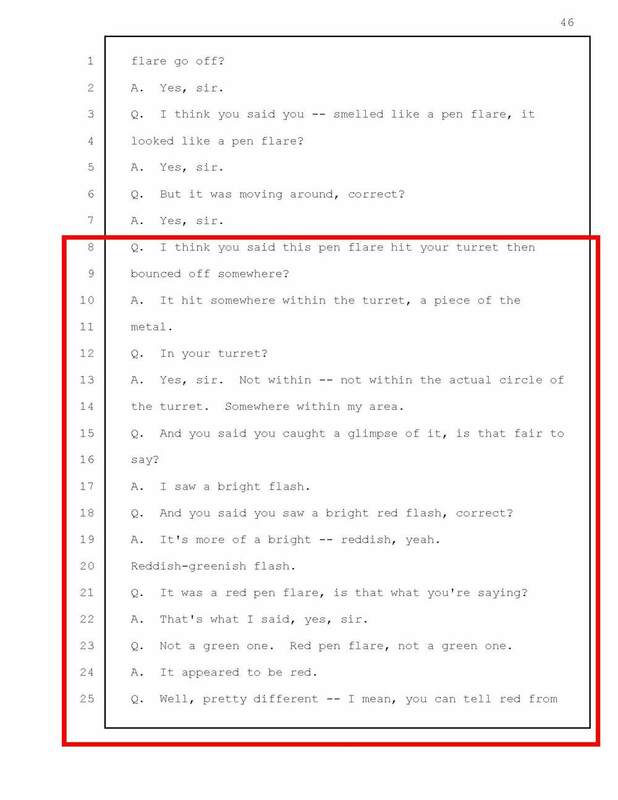 The government's cooperator - for some completely unknown reason - tries to convince the government that he KNEW it was a pen flare, despite Dustin Heard's claims at the time. 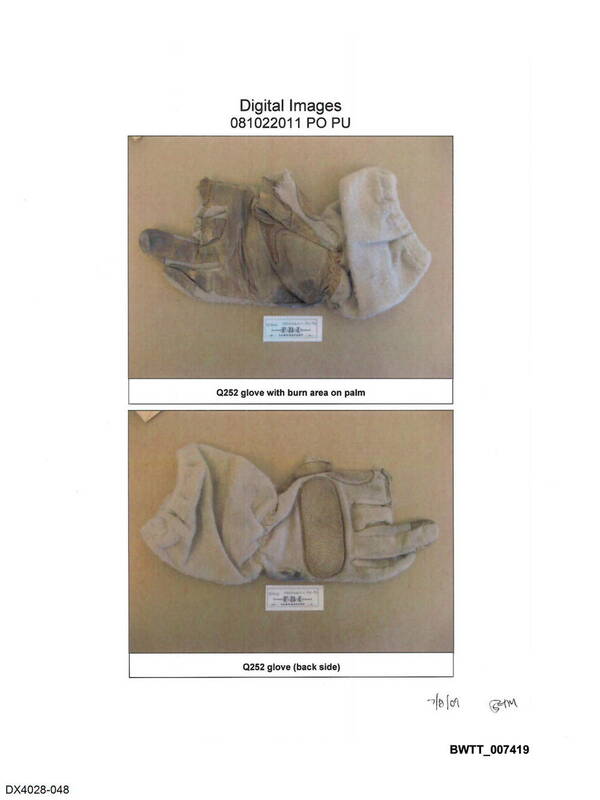 The government - for a clearly-obvious reason - had the FBI test the burned clothing ONLY for a pen flare and not a tracer round. And nearly got away with it. As the prosecution listens in on the defense's telephone conversation with the Government's Expert Witness, they suddenly realize that they've been caught trying to skew the expert's testimony. 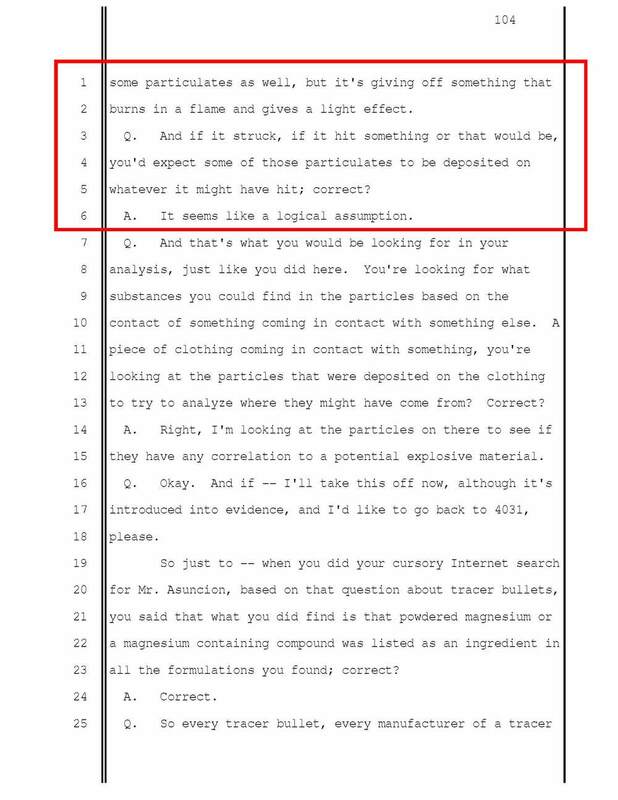 When the defense asks if the expert ever tested the burned clothing for tracer round residue - and he says no - the government realizes how that will look to the jury. Quietly, after the telephone meeting, lead prosecutor Anthony Asuncion slips an email over to the expert, and asks him to test a tracer round . A test that should have been conducted 5 years prior, when the Expert first began his testing. The prosecution's direction to the FBI lab as to what they should and should not test for was highly improper, especially given that the prosecution KNEW a tracer round was a likely source. Unfortunately, presence of a tracer round was one more piece of the puzzle that would have dismantled the prosecution's theory of massacre. Knowing that he's been caught trying to skew evidence results and trial testimony, the prosecutor sinks to sneering derision. Below is the email from the government's own expert. Did he bother to actually TEST a tracer round? No - the FBI took the light-handed approach and merely did an internet search. Wouldn't want to find TOO much evidence, now would they? The next day, The Fifth Man takes the stand. 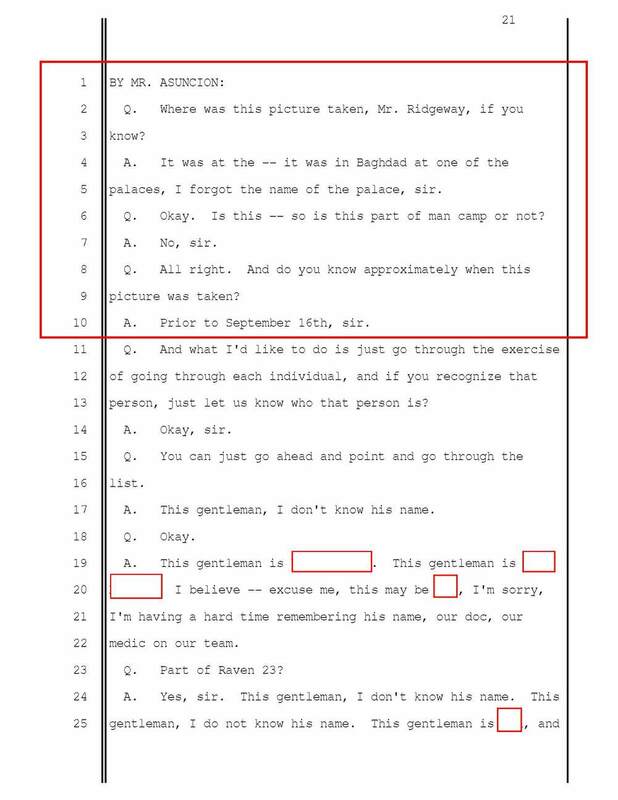 This is his excerpted testimony related to the Burn. Notice how on Cross examination by the counsel for Dustin Heard, the Fifth Man suddenly turns the color wheel on its head and tries to sell a red-green color combination. WHY would he do that? 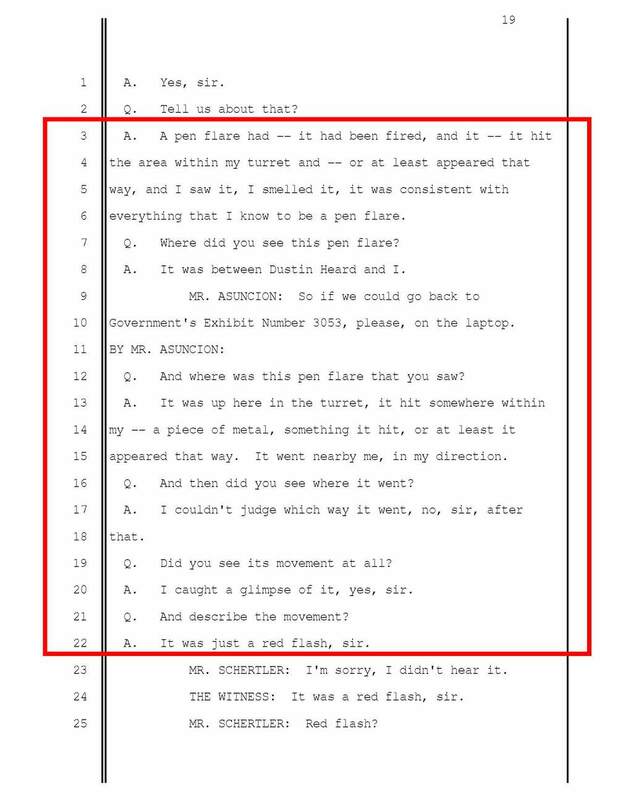 What tampering of this witness might have occurred that could have made the red flash that he had seen previously, suddenly become red-green? It defies logic to think he came to this "revision" on his own. You may wonder why the defense counsel asks if Dustin's comment to the Fifth Man was made "sincerely". Counsel was attempting to give some credibility back to the men of the convoy - credibility that had been stolen by the prosecution when they suggested that the team was MAKING UP the calls they were issuing over their comms. This prosecution team had no "bottom" to how low they would sink to sell the "massacre" story. And now we get to the closings. First, what the Government had to say. Again, with the ridiculing attitude from prosecutor Asuncion. But the prosecution just wouldn't quit. Even with the astounding admission that their case against Dustin was weak and that the only evidence they had against him was the word of The Fifth Man. Not only that, but in COMPLETE FABRICATION - prosecutor Pat Martin says "What you know from Mr. Heard himself." FOUL!! 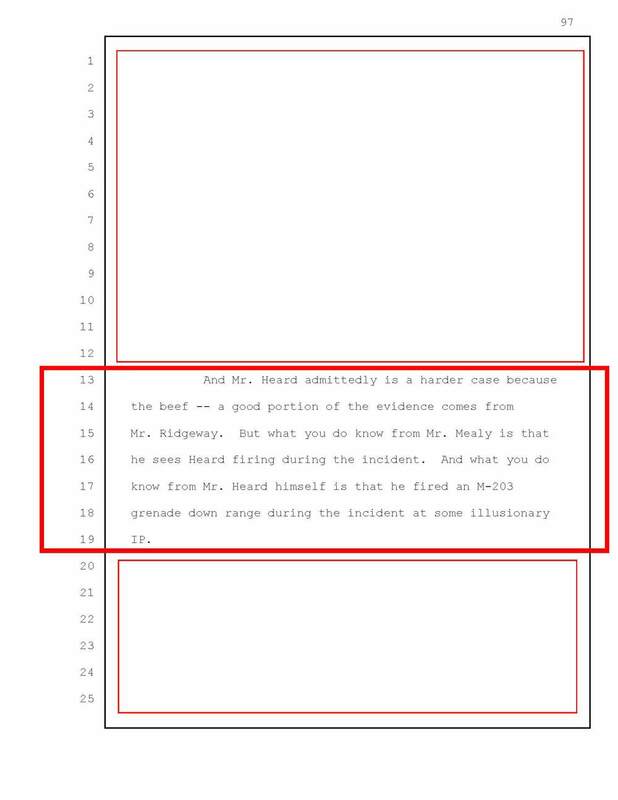 Mr. Heard did not testify, so the jury heard NOTHING from Mr. Heard. But Martin knew his voice was going to be the last voice heard from the lawyers. This comment came during Rebuttal Closing. The defense never had a chance to call Mr. Martin out on his lie. And just for fun, here's some of the Toby Keith photos referenced. According to Dustin, most of the team wasn't very happy about the photo op, contrary to what people might believe. They were ordered across the city to DIA for purposes of the visit only - back and forth down Route Irish. Look it up. Not exactly a pleasant drive.